The reign of Augustus is one of the most interesting periods of classical history- what had been an anarchic republic was seemingly transformed in the space of the 45 years between the Battle of Actium and the succession of Tiberius into the Roman Empire. Augustus created a political order that endured after his death down to the reign of Diocletian in the 3rd Century AD and he created two titles- imperator the root of our modern emperor and Caesar the root of both Tsar and Kaiser which endured and endure into our own century. 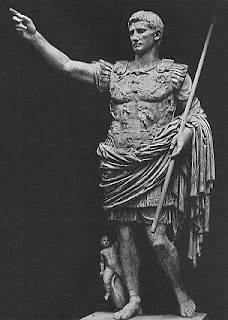 Augustus though is not an easy individual to approach- we lack sources- Tacitus the most vituperative chronicler of Roman imperial folly for example starts his account with Augustus but spends little time on the founder of the empire before he proceeds on to his successor Tiberius. It is therefore good news that Augustus has found a modern biographer who whilst he does not skirt around the problems particularly with relation to the evidence still provides a coherent and readable account of the life of the first Emperor. Professor Werner Eck's book, The Age of Augustus was first published in German before being transalated into English. He presents us with an incredibly readable account of Augustus's career- starting basically with the moment of Julius Caesar's death and describing the way that Augustus manoeurvred his way into power and then in power. The first sections of the book running down to the Battle of Actium are basically a narrative account of Augustus's rise over his rivals whether Republican or Caesarian. The second section of the book attempts to anatomise the development of the Principate and what it meant for Rome. In exploring this Professor Eck supplies his reader with a couple of central theses around which he bases his understanding of Augustus's reign. The first of these principles is that Augustus functioned as a traditional Roman senator. He was fixated on his own families honour- Professor Eck chronicles the way that Augustus attempted to manipulate the succession so that a blood relative would succeed him. The practice of auctioning off his daughter Julia to the suitor who suited his politics most was not merely born of political expediency, he also hoped that an heir would be produced who would continue his line into the future. When that failed he of course adopted his step son Tiberius. Furthermore Eck argues that Augustus's policies in terms of the Roman Empire were resolutely traditional- he sought to expand the Roman Empire into new provinces, making a concerted effort to conquer Germany and succeeding in annexing both Pannonia and new territories in Spain and Egypt to the Empire. If Augustus was a traditional Roman senator in many of his attitudes, Proffessor Eck leaves us in no doubt that he had little sympathy for the Republic. The second dominating impulse of Professor Eck's account of Augustus's life is the man's ambition. Augustus played a game of unscrupulous power politics against his rivals before he came to become Princeps. Professor Eck is incredibly interesting on the subject of what that role of Princeps meant. He reminds us that Augustus did not take the title Emperor but rather confined his titles to sit within traditional Republican categories. Eck argues that Augustus sought to consolidate his power without repeating Julius Caesar's mistake of antagonising the mob by claiming the crown. His power in Eck's view lay firmly in Augustus's proconsular control of the border provinces and hence of their legions. It was fortified by the particular debts owed to him by legionaries who were sustained by his largesse. Augustus with the army at his back then worked upon the traditional Roman respect for military success and attempted to change the iconography of the Roman capitol, building statues and temples, fora and controlling the grain supply in order to convince Roman citizens he was their best protector. There is also, Eck argues, evidence that he fulfilled this role in the provinces as well. Thirdly Eck suggests Augustus was a formidable political operator. He controlled the Romans by making them think that he was the best solution to the problems of the civil war. Well aware of the issues that Rome faced, Augustus promised peace to Rome and its ancient freedoms. Though he constrained those freedoms and was outside the empire committed to warlike expansion, he was able to convince the Roman people and senate that he was a bringer of peace. He was also keen via constitutional changes to bring the system around to focus upon his own powers- he for instance maintained a strong interest in reducing the number of senators down from around 1,000 to around 600. Fourthly and lastly Eck leaves us in no doubt that Augustus's survival for so many years fortified the political order that he had created. By the time that he died there were few if any senators alive who had participated in true Roman senatorial government. There would have been several moments before his death where if he had died the succession would have been uncertain and rival claimants might have emerged, furthermore if he had died earlier senatorial government might have been reasserted. As it was his long life created the impression for Roman citizens that they had always had a first citizen and this is what his authority had always looked like. Professor Eck's book is a wonderfully concise and clear explanation of Augustus's rule. It does have its flaws- footnotes to other scholarly work are conspicuous by their absense, it would be interesting to have heard more about Augustus's efforts at the moral reformation of wider society- but then there is a limit to what you can fit in the 176 pages he allows himself. There are I am sure flaws in his account- and flaws in this review- but this is a good introduction to the reign of Augustus and the way that the Principate was created. If anything else it will suggest to you that the empire was an evolving construct- Augustus created it very slowly in his reign and it is arguable that the traditional image of the emperor in our culture dates from considerably later. I mentioned at the beggining that Tacitus doesn't really address Augustus's reign- my view of that is that Tacitus understood this and wanted his history to be a diagnosis of the imperial system's faults rather than a description of how it was created. Professor Eck has done good work here, and I think his book deserves to be recommended. Which he actually was. Pity he was followed by Tiberius and Little Boots.